Design New England March/April 2013, "A touch of glass." Kitchen design by Paul Reidt. Boston Home, Spring 2013. KR+H built the kitchen, kitchen tables, beds, and side tables for this home on Martha's Vineyard. New England Home, March-April 2013. "Sketch Pad" covers The Hidden Kitchen design by Paul Reidt. A special thank you to the editor, Kyle Hoepner. Paul captured this view of Central Park from a KR+H project site in NYC. Since KR+H's Hidden Kitchen was shown in New York City in 2011, it has been our delight to see how it inspires homeowners. Both functional and aesthetic elements of our Hidden Kitchen are being revealed in new kitchen designs for our customers, including two projects in NYC. One New York couple who saw KR+H's Hidden Kitchen at The Architectural Digest Home Design Show was drawn to its hidden function and furniture look. The townhouse the couple is renovating will include a kitchen by KR+H that will be in concert with their Chinese Deco furniture collection. Another New York couple saw our Hidden Kitchen at ICFF, International Contemporary Furniture Fair, and was drawn to its back-painted, acid-etched glass that offers a play of translucent color blocking. KR+H kitchen, designed by Paul Reidt, for one of our New York City projects. The homeowners selected acid-etched glass back painted with the colors of "deep poinsettia," "oracle," "argyle," and "stone." The color block design will be paired with maker wood. The idea of incorporating luminous color blocks into a kitchen's design has appealed as well to Boston homeowners who visit KR+H's showroom. One Boston homeowner, a returning KR+H customer, worked with us to design and make the kitchen for her new home in Boston's Fort Point Channel, incorporating back-painted, acid-etched glass. Her elegantly modern and colorful kitchen has been selected by Design New England magazine for a photo shoot and will appear in an upcoming issue. We'll keep you posted! To learn more and see our video revealing the secrets of KR+H's Hidden Kitchen, go to Paul's post: The Hidden Kitchen: a place for everything. Paul and I met upon his return from KR+H's second year of exhibiting at the International Contemporary Furniture Fair. ICFF is America's largest home design and furniture show held at NYC's Javitz Center with some 25,000 visitors, mostly design trade professionals, exploring exhibits from around the world. At this year's ICFF, Paul found a renewed optimism. There was an inspiring showing of new ideas by young innovators. The New York Times article that reviewed ICFF, Going With the Grain, reported on the growing rise of hand made. Paul was delighted to see visitors' responses as they discovered the secrets of KR+H's [Hidden] Kitchen furniture. 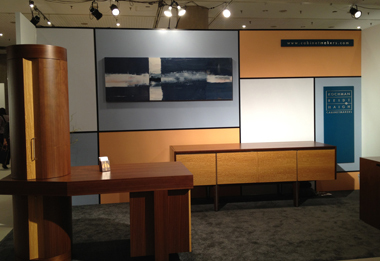 KR+H's exhibit at ICFF was truly a collaborative effort of our designers, engineers, and crafts people. We had the good fortune to have our exhibit sparkle with the diptych, Skate, by artist Jeffrey Keith. Thank you Jeffrey! To learn more about KR+H's [Hidden] Kitchen furniture, see Paul's post below. We'd love to hear your comments. Drawings are the intermediate step between creative imagination and built structures. They are usually my first contact with projects and after reading them for thirty years I have long recognized that, like most forms of human communication, they come with a full foundation of subtext. Their immediate purpose is technical specification, but they can suggest far more by the graphic style, the room labels, and the architect's decisions about what information is included (and excluded). Good design integrates and balances multiple layers of program and aesthetics, but every set of drawings will give clues to the designer's priorities. You can usually tell whether the architect favors the exterior composition over the experience of the interior spaces and even whether the relationship between the architect, owner, and builder will be collaborative or controlling. Room labels can be as expressive as the names for paint colors or as prosaic as "family room" and "study." I have worked on a few overblown projects where a surfeit of rooms emptied the label bank and left undefined rooms stranded in Starvenia. Even in the smallest dwellings, however, there is always a space marked "kitchen" and it never fails to hold my attention since this is not only the heart of most homes but also the primary focus of our work at KR+H. This is the simple idea behind the new kitchen furniture that KR+H will unveil at ICFF, the International Contemporary Furniture Fair in New York City, May 19-22. We have concealed CC+S in two pieces of furniture made from quartered black walnut and figured satin wood. Our hidden kitchen pieces also include The Cube, a table and chairs that fit together like a three dimensional puzzle. Please visit us at ICFF, Booth 2358, and find a full kitchen and dining space hiding in 200 square feet. Welcome to our "press kit" for the Architectural Digest Home Design Show. 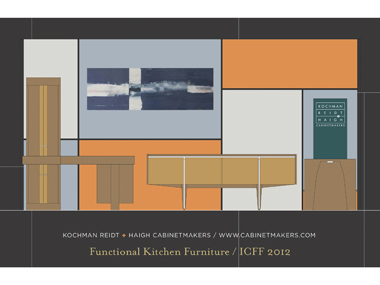 Kochman Reidt + Haigh Cabinetmakers is a design + build firm in the Boston area. Along with our own design projects, we make custom cabinetry and woodwork designed by architects and interior designers. At this year's ADHDS, we will introduce our newest design in KR+H's hidden series, The Cube: 36x36x36. Our simple form has a rich surface and hidden assets. When this furniture is at rest, four stools nest within the table. The Cube is made from American black walnut and anodized aluminum. There's a great story behind The Hidden Kitchen. Take a moment to read our blog post The Hidden Kitchen: a place for everything. Both The Cube and The Hidden Kitchen were designed by KR+H's president, Paul Reidt. Paul will be at ADHDS for all four days of the show. Our booth is No. 269, and we hope you'll stop by and say hello. All the professional photographs of The Cube and The Hidden Kitchen are at the beginning of KR+H's projects portfolio. High resolution images are available. For more information, please contact Linda Kochman, linda@cabinetmakers.com, 781-573-1542, or Paul Reidt, paul@cabinetmakers.com, 781-573-1515.